The one and only tool that leaves no stone unturned in migrating data from Lotus Notes email client and Domino Server into Microsoft developed client and server email program i.e. Outlook and Exchange Server is none other than Mail Migration Wizard. The Mail Migration Wizard is the perfect example to be used for migration of data from Lotus Notes NSF files and also Domino Server to either MS Outlook email program or Exchange Server. This is because it provides user friendly and self explanatory interface to migrate data from one platform to the other. It avoids any such complexity that might prove difficult for users to make use of the tool for conversion purpose. Moreover, it offers number of matchless characteristic features that are unfound in similar applications. Lotus Notes data saved as .nsf file format can be migrated to .pst file type, i.e. from one email program to the other. The converted files can be further imported and used easily in Outlook, regardless of its version. In this way the wizard achieves successful migration. 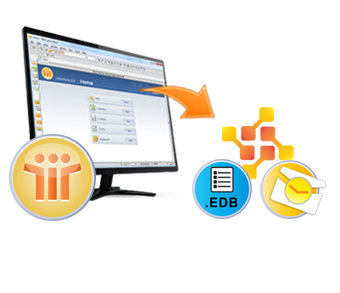 IBM Notes email program stored data in NSF file can be exported into Live Exchange environment easily without limitation of any sort. With this, the tool accomplishes success in migrating data of an email client into another server. Mailbox data of IBM Domino server can be moved into Personal Storage Folder without any restrictions or complications. With this, the application attains victory in migration of emails from server to a different client. Data saved in Domino Server can be migrated to EDB file of Exchange environment that stores multiple mailboxes successfully and with ease. With the usage of the exporter software application server to server migration of data is possible. The tool can remove all types of encryption from the email messages in NSF files and transfer NSF data into MS Outlook or Live Exchange Server. However, this is an optional feature that can be utilized if necessary. All the 4 possible migration options of emails and other items can be achieved in batches by the third party software. It is a really enhanced and advanced feature as it saves users time. Three specific filters; Email filter, Calendar filter, To Do Filter are provided to export only the requires emails, save calendars within a range of date and move tasks created in particular time interval only. There may be many such folders that are not needed, hence they can be restricted from exportation. The options provided are for Sent Items, Deleted Folders as well as others that can be named to avoid their migration. The email meta data such as To, From, Cc, Bcc, etc. remain unaltered after exportation. Also the hierarchy of the migrated files and folders is kept unbroken as well as unhampered by the software application. The export wizard is capable to migrate all types of NSF files data or Domino Server data; be it email messages, contacts, calendars, notes, tasks, etc. Information can also be any type of multimedia data. Can I use this Software on MS Outlook 2013? Yes, This software works well with all Microsoft Outlook edition 2000, 2003, 2007, 2010 and 2013 (32-bit). Does this software converts encrypted NSF mails into Outlook PST? Yes, Mail Migration Software safely convert encrypted NSF mails to Outlook PST with 100% accuracy. For using this Software Outlook Installation is required? Yes, Software requires Outlook Installation and also be configured with POP3 account. Is this tool requires Live Exchange and Domino Environment on Machine? Yes, Software requires Live Server Environment of Lotus Notes and Exchange for migrating Mailboxes from Domino to Exchange.